← Your Chance To Win The Brand New Jensen Keets CD! I’m delighted to report that during the past week, I have added a dozen new video clips from Alive with Clive to The Alive with Clive TV Channel on YouTube, which you’ll find when you click here. These video clips are from shows that were recorded from January through March of 2011. Based on a recent check of the stats, a total of 43,187 views have been recorded for the video clips that have so far been posted. 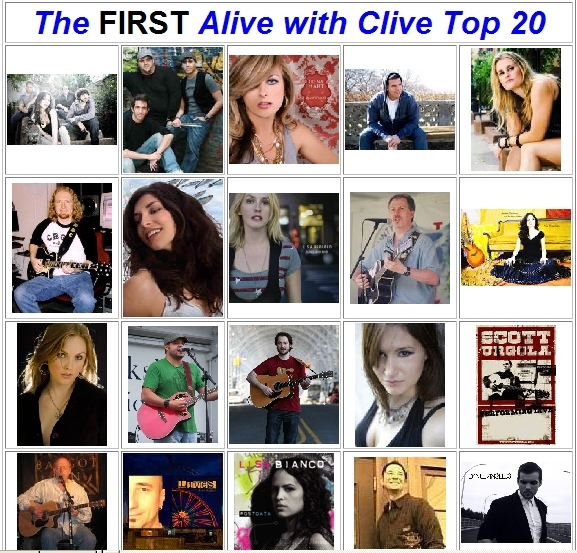 As a reminder, each of the singer/songwriters who has been interviewed on Alive with Clive is eligible to be in The Alive with Clive Top 20. To see all the contenders and to vote for your favorite or favorites, click here. In addition, there is still time for you to obtain one of the exclusive signed and numbered limited edition copies of the physical CD of The FIRST Alive with Clive Top 20. Initially, only 100 were created and remaining supplies are expected to dwindle fast after an upcoming promotion is announced. If you become a Gold Member of The Alive with Clive Global Community now, you’ll not only obtain one of these CDs, you’ll also obtain the now famous “I’m Alive with Clive” T-shirt, plus several other phenomenal bonuses, absolutely free! To find out more about The Alive with Clive Global Community and how you can become a Gold Member now, click here. Several more video clips from Alive with Clive will be added to The Alive with Clive TV Channel on YouTube in the weeks ahead. I highly recommend you take some time in the next three days to watch the video clips so you can have the best Labor Day weekend ever! This entry was posted in Alive with Clive and tagged "It's Gonna Be Love", Adam Popick, Alive with Clive, Alive with Clive Global Community, Alive with Clive Top 20, Alive with Clive TV Channel on YouTube, Calling You Out, Canvas, Cassandra Kubinski, Cat Cat Cat, Celadon Candy, Charlie Sabin, Christopher Moon, Claim My Prize, Corner, Craig Wilson, Daisy, Dear Love, Disaster, Gold Member, I Think Of You, I'm Alive with Clive T-shirt, Inna Beynishes, It's All Over Now, Joséphine, Kim Lamothe, Kristin Hoffmann, Kyle Ryan, Little Have Not, Madi Diaz, Miranda Inzunza, Mr. Hunter, Natasha Alexandra, NLX, Paul Tabachneck, Pretty Music, Smoke and Mirrors, Sweet, Tania Alexandra, The FIRST Alive with Clive Top 20 CD, video clips, Wash It All Away. Bookmark the permalink. 2 Responses to A New Dozen Alive with Clive Video Clips on YouTube!